But in the meantime, I’d like to talk to you about something I’ve been thinking a lot about lately: the responsibility of riding. I admit, it’s a weird word to associate with motorcycles. Everyone knows riding a motorcycle is dangerous, so anyone who chooses to do it must be irresponsible, right? I mean, yeah, some riders are irresponsible. But is everyone who rides irresponsible? That can’t be so. 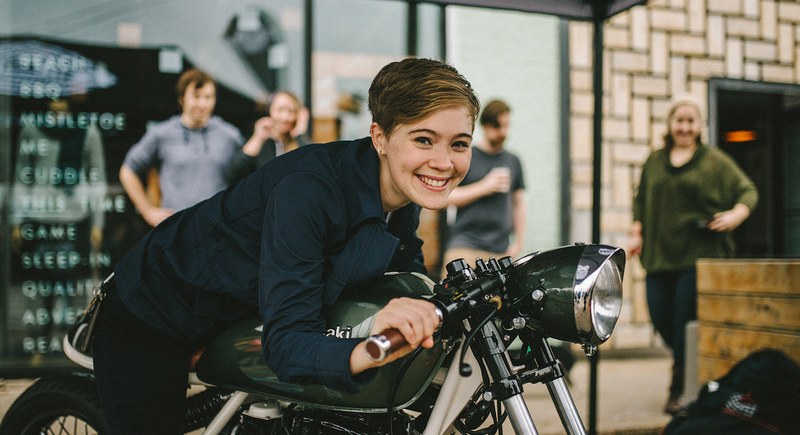 I’ve met so many inspiring, driven, responsible people though the motorcycle community — people who run their own businesses, travel the world, and care deeply for their family and friends. How could such people be irresponsible, just because they ride a motorcycle? Yeah, riders are different than “most people.” We’re adventurous and a little rebellious. We want to experience life by living it. But that doesn’t make us inherently irresponsible. I started thinking about this connection after reading some articles by Jim Davis over at msgroup.org. Jim is a recognized expert witness in motorcycle safety, he’s been riding for nearly 50 years without a single accident, and he’s written two books teaching riders how to, above all else, make sure that if they ever happen to be in an accident, it was not their fault. If that isn’t a good objective to strive for when learning to ride, I don’t know what is. So I started reading his first book, which can be bought as a PDF here. In the book, Jim admits that sometimes he and Cash, his co-author and riding partner, can sound like old curmudgeons, but you can tell from the energy he’s put into his website and books that he genuinely cares about sharing information that he knows and can prove will help riders keep themselves safe. In the opening chapters of his book, Jim hits really hard on attitude and motivation. He encourages readers to think critically about why they got into riding, and to identify immaturity in themselves that could lead them to make unwise decisions further on down the (literal and figurative) road. This is before he touches on ANY sort of riding technique, gear or safety lesson. Attitude first. In this section he tells people that if you can’t afford or don’t want to spend the money it takes to get quality gear, you shouldn’t be riding. If you want to ride to prove a point to others, you shouldn’t be riding. If you think you’re immortal, prioritize ‘having fun’ over making the right decisions, or feel the need to act like you have all the answers, you shouldn’t be riding. I mean, I’m definitely a bit of a rebel. And I’ve seen my ugly side when emotions like exuberance, inadequacy or perversity overrode my better judgement. Does that mean I should tell Sofi to forget about the Rat and stick to a cage for the rest of my life? Aagh, no, that’s too painful. So I kept reading. And as I read I realized Jim means that these characteristics shouldn’t be the foundation of your motivation to ride, and none of those qualities even get close to explaining why I ride. My motivation for riding goes much deeper. It’s a primal need to be outside, to get my adrenaline going a bit, to be part of the world rather than an observer. It’s hard to put into words. But I’m sure you know what I mean. And then I realized, that motivation is worth leaving behind those petty, all-too-human complaints about low self-confidence, authority or my own mortality. That motivation helps me accept that those things exist, and write them off as unimportant to my end goal: living the life I want to live. When you think about it, there is no other way to overcome low self-esteem, hatred for authority, or your own mortality EXCEPT for just letting go. There will always be a government over your head, you will always be mortal, and the more you stress about being “cool” the harder “coolness” becomes to attain. Jim’s point is that struggling against those realities instead of accepting them can lead you to places you don’t want to go, lead you to make decisions that could end up fatal. Anyone can crash a motorcycle. Becoming a lifelong rider takes determination, focus, and grit. I don’t know about you, but I know which of those I’d rather be. So, getting back to my original statement, some people who ride motorcycles are irresponsible. But if you do ride a motorcycle, and love to ride (i.e. not crash), chances are, you will actually become more responsible, because the motivation to ride again tomorrow is more powerful than an immature need to lash out against realities you cannot change. Thanks for tagging along on another inquiry into motorcycle philosophy, guys. I really appreciate every single one of you, and I sincerely hope that you all have a wonderful (injury-free!) 2016.